Customize your parts box for the parts YOU carry! Adjustable dividers allow you to configure these parts boxes exactly for your needs! Dividers are tight to the overlapping lid, to keep small parts from mixing into other compartments. Translucent polypropylene plastic is resistant to oil and most chemicals. #36250 Small, 7" x 3.5" x 1.5"
#36252 Medium, 11" x 6.5" x 1.75"
#36254 Large, 13.5" x 9" x 2"
Overall Dimensions: 7" x 3.5" x 1.5"
Small parts box with adjustable dividers allow you to set the compartment sizes just the way you need them! Includes 6 adjustable divider inserts. 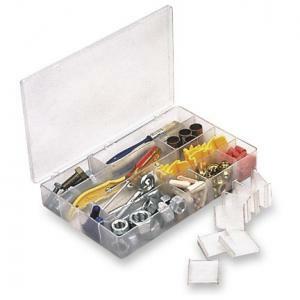 Overall Dimensions: 11" x 6.5" x 1.75"
Medium parts box with adjustable dividers allow you to set the compartment sizes just the way you need them! Includes 10 adjustable divider inserts. Overall Dimensions: 13.5" x 9" x 2"
Includes 15 adjustable divider inserts.